Even though this common truth is widely known, not all companies become successful. The stumbling stone is the ability to find out and recognize true challenges and desires of the target audience. It is not a good sign when an interviewer talks more than a respondent. It might be tempting to start “selling” your idea but such approach will not help to understand whether potential customer likes it. One of the most important rules is to listen carefully what respondent says rather than share your views and ideas. It will help to focus on customer’s habits, their likes and dislikes, difficulties and needs. As a result, a lot of valuable inputs can be received which would ultimately benefit your product. 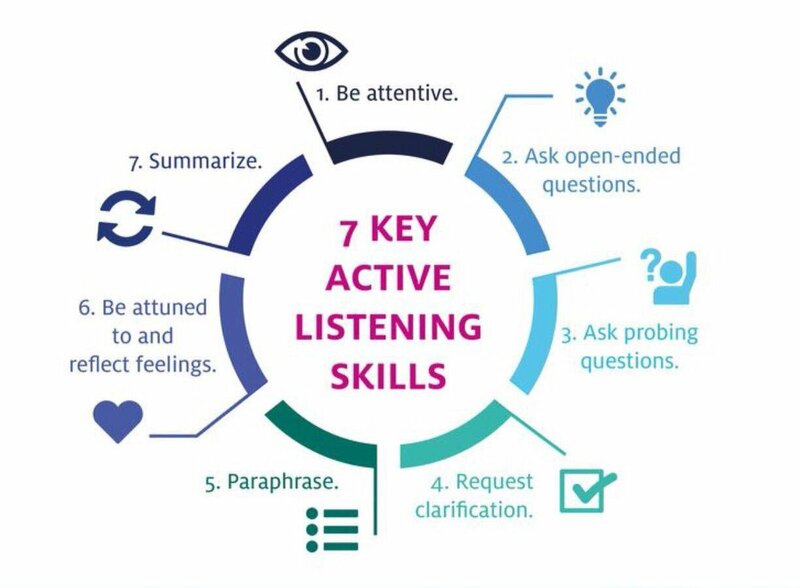 One of the most popular and effective practices of listening is Active Listening. A short overview of the technique is described in the picture below. The communication between interviewer and respondent will be smooth if the talk is structured and you don’t “jump” from one topic to another forward and backwards. Be consistent and make sure that your conversation is logically structured. Of course, you cannot predict all questions which you will ask as many of them will be based on the information you find out during the interview, but make sure that the interviewee follows your train of thought. If the conversation is based on close-ended questions, it is unlikely that any new valuable information will be uncovered. Close-ended questions usually limit the answers to a short single-worded response and do not help to build any extended conversation (Example: Do you usually drink tea or coffee?). Try to formulate open-ended questions in order to engage respondent in conversation and get as much information as possible (Example: What do you usually drink?). The obvious advantage of an open-ended question is that new unexpected information can be uncovered which you did not take into account before. Questions about future are not recommended on the interview because they will allow respondent to start imagining possible scenarios, share subjective opinion and make predictions. Such questions are misleading because they are not based on facts. It is an assumption that respondent does for you (Example: What features do you think would be useful in this mobile app?). The right approach would be to focus on past and present rather than talking about future (Example: Could you please show us how you are using the app? Is there any difficulties that you encounter?). Ask respondent about their real experience now and in the past, ask about specific cases, which difficulties respondent encountered and now they resolved them. Using silence is a powerful way of questioning. Pauses in speech can help lay special stress on some things and/or give all parties a few seconds to gather their thoughts before answering. There is a “3-second” rule of pausing. A three-second pause before a question helps to emphasize the importance of the question. A three-second pause directly after a question shows to the interviewee that a response is expected. Pausing again after an initial response encourages the respondent to continue with a more detailed answer. Pauses of less than three seconds have been proven to be less effective. When building conversation, it is vital to know how to behave, how different question types work and what result they will help to reach. Avoid manipulating with close-ended questions, focus on user’s needs and not on “selling” the idea, ask about past instead of future and you will see that meeting customer’s needs is not as challenging as it seemed to be. This entry was posted in Business, Startups. Bookmark the permalink.